Breaking News | Old Market Gateway. The proposed development will comprise up to 13,000 sq ft (1,208 sq m) of retail accommodation with 38 dedicated parking spaces. Available as a single unit, or in a combination of smaller individual units. New lease(s) will be offered on F.R.I terms. Rental on application. The unit(s) will be built to a developerâ€™s shell speci cation with capped off services. A specification is available on request. To be assessed following completion of works. This is opposite the Old Market next to the Merton Meadow. Herefordshire Housing application. Also providing 51 new build apartments as part of this application. When are they starting to build these? Wondering that too.Harpers are building the retail/restaurant etc and Herefordshire Council are using keepmoat to build the homes. The right hand unit is a restaurant/takeaway.Could we be seeing a Burger King? 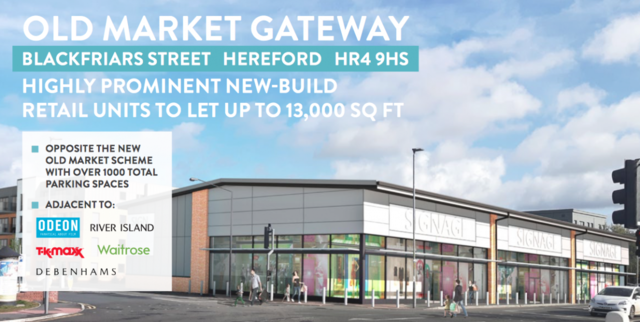 And Morrisons are opening their new supermarket in Abergavenny early 2018!! Totally off topic but felt it deserved a one liner! I personally like the Old Market but in my opinion in should of all been under cover. This extension could be good. So basically it's a big shed with all the architectural elan of that two-storey Portakabin extension to the Robert Owen Academy. Plus ca change; plus ca la meme chose! News just in.Toby Carvery are interested in coming to Hereford.Could it be here ? Or rather they were interested a year ago but have since lost interest. Thereâ€™s a post going around Facebook (again) about it but if you look at the date of the article, it was written a year ago but most people donâ€™t seem to check these things.I hope they do come here but the carvery at the Bunch of Carrots is good enough.